Train 010 Moscow - Irkutsk (Baikal). Train schedule in Moscow. Yaroslavsky train station. Train 010 Moscow - Ekaterinburg (Yekaterinburg) - Novosibirsk - Irkutsk. Transsib. Trans Siberian railway. Train Siberian. Transsiberian railway. Schedule. Price in train ticket. The train 10 - Baikal Express brings you to the Great Lake Baikal and to the one of the most beautiful cities in Russia - Irkutsk. Train 10 one of the best trains in Russia. 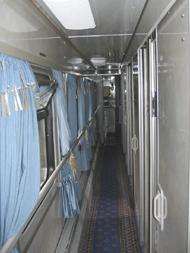 The train has both 1st and 2nd class compartments. The train also has a small library and play room for kids. 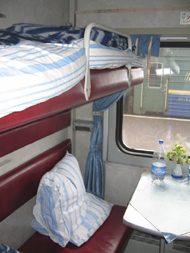 Every single carriage is equipped with a shower, microwave and a refrigerator. The restaurant wagon is said to be quite good as well. Train 10 (Moscow - Irkutsk) departure from Moscow every odd days during a week on 23:35 (Moscow time). If in a month of 31 (29) days, train 10 departure from Moscow on 29, 31, 2, 5, 7... day of the month. 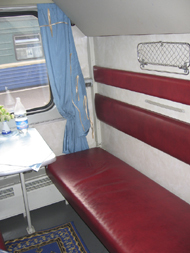 This train arrives to Irkutsk for the fourth day (even days a week, 09:13, local time). If in a month of 31 (29) days, train 10 arrives to Irkutsk on 30, 1, 3, 5, 8, 10... day of the month. Train 010 Moscow - Irkutsk (Baikal). Train route. Price in train ticket. Train 009 Irkutsk - Moscow (Baikal). Train route. Price in train ticket.